Home » Considering Joining the Church of Jesus Christ of Latter-day Saints (Mormon Church)? Considering Joining the Church of Jesus Christ of Latter-day Saints (Mormon Church)? Mormons are known as sincere, spiritually devoted people, good neighbors, and responsible co-workers. They have qualities we admire when it comes to moral living and family values. Yet their history is shrouded in controversy and their beliefs often not accepted as a Christian. What brings the Mormon Church under such scrutiny? The authenticity and credibility of the Mormon movement rests squarely on the integrity of its founder – Joseph Smith – and his claim that God the Father and Jesus appeared to him in a vision. Joseph also claimed that several years later an angel guided him to gold plates. From these he produced the Book of Mormon which he claimed was another historical book of divinely inspired scripture, of equal authority to the Bible. "The authenticity and credibility of the Mormon movement rests squarely on the integrity of its founder – Joseph Smith." A Modern-day Prophet of God? Is this the sort of man you would trust if he told you that God appeared to him as a 14 year-old boy and told him all other Christian churches were wrong? Should we simply take Smith’s word when he claims he no longer has the gold plates from which he produced the Book of Mormon because he had to return them to the angel? If Joseph Smith’s claims fail where they can be tested by empirical evidence, how wise is it to trust his story where it cannot be verified? Since Joseph fails in his ability as a “translator” of the Book of Abraham when his work is tested, how can we accept the claim that he translated the Book of Mormon from gold plates? Mormonism pays lip service to the Bible, but only uses it when and where it appears to support Mormon teachings. Joseph made the baseless claim the Bible was unreliable and missing important parts. This opened the door for Joseph to produce his own revelations. The Mormon Church now claims these “Latter-day revelations” trump the Bible, so if any Mormon scripture conflicts with the Bible the Bible has to be wrong. Is it any wonder almost every Christian denomination considers Mormonism a spurious and counterfeit form of Christianity? There is a complete lack of evidence from science, the Bible and history to support Mormon claims. No wonder the Mormon Church asks people to ignore objective evidence and rely on their feelings to evaluate the Joseph Smith story. Mormon missionaries make it sound spiritual to pray and ask God if Joseph is a true prophet rather than looking carefully at the life and teachings of their founder. But is it really “spiritual” to try and get a good feeling about something being true, while you ignore all the evidence that points to it being false? Faith certainly plays an important part in our relationship with God and sincerity is an admirable quality, but God also gave us our minds – does He really expect us to ignore evidence of spiritual fraud and take a blind leap of faith? V.R. and her husband had some reservations, but joined the Mormon Church anyway, only to find "the emphasis on family has a dark underbelly." They share some of what disturbed them. Read their story here. They are Christians, the Mormon Church is a Christian Church and that every church has some truth. They never criticize other churches. Their beliefs are all based on and compatible with the Bible. 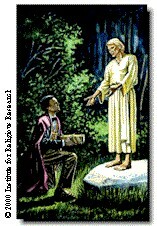 God called a 14 year-old boy, Joseph Smith, to restore truths that had been lost to Christianity for around 1800 years. 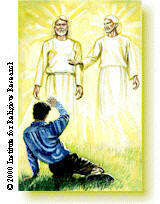 God did this by appearing personally, along with his Son Jesus, to Joseph Smith, in what is called the First Vision. God later sent an ancient warrior named Moroni (now an angel) to show Joseph where to find gold plates written in an ancient language that Joseph would translate into the Book of Mormon. You can find out for yourself if the Book of Mormon is a true scripture and Joseph Smith is a true prophet by asking God in prayer if this is so. If you meet the necessary conditions (a sincere heart, real intent, and faith in Jesus) God will give you a revelation through some sort of subjective experience that confirms that everything they have told you is true. This way of knowing something is true is supported by James 1:5 which says to ask God if you lack wisdom. God built his church on the foundation of apostles and prophets (Ephesians 2:20) so the true church today should have modern day apostles as well. Through special rituals (they call them ordinances) offered only by the Mormon Church, families can be united (sealed) and expect to spend eternity together as a family unit. According to Mormon Scripture all other churches are in error, all other church creeds are an abomination to God and all those who profess belief in those creeds are corrupt. The main teachings of the Mormon church on topics like the nature of God and Jesus are radically and irreconcilably different from all other Christian churches and are contradicted repeatedly by clear statements from the Bible. Joseph Smith told several versions of his first vision, making it bigger and better as he went along. Joseph did not tell the current “official” version of the first vision until 18 years after the supposed event. Joseph Smith’s discovery and production of the Book of Mormon was rooted in his and his father’s superstitious and occultic practice of digging for money. 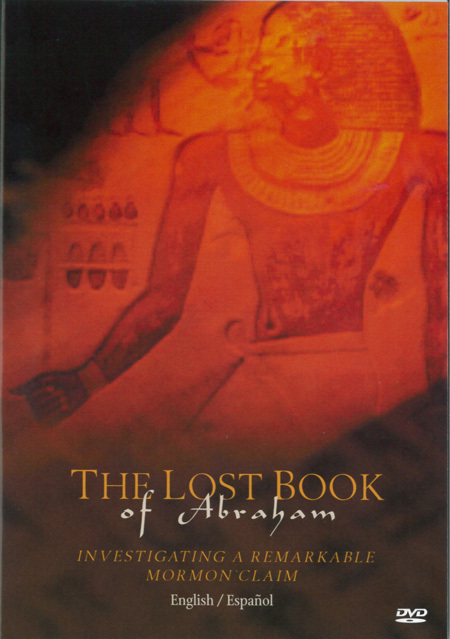 The Book of Mormon lacks archaeological, geographical, linguistic, anthropological and biological support for its claims to be an ancient historical text like the Bible. See documented evidence here. The Book of Mormon contradicts both the Bible and other Mormon Scriptures. This could be why they want you to pray about it instead of investigating it carefully. See examples here. The “test” to know if the Book of Mormon is true by “praying” about it, is a clever psychological trap. It is set up so if you do not get a subjective confirmation the Book of Mormon is true than the problem is your lack of faith, your lack of real intent or your insincere heart. With their test, there is no way the Book of Mormon can be proved wrong. The verses they use from the Bible to prove their points are taken out of context or use faulty logic in their interpretation. See one example here. The secret temple ceremonies so important to Mormon salvation have their origin in Masonic rituals which Joseph Smith and his brother Hyrum both learned before introducing their own temple ceremonies. Read more here. All of us feel things, and many of us have had subjective, intuitive experiences that we thought came from someplace outside ourselves - maybe even God Himself. We tend to remember the experiences that worked out, the ones that confirmed what we thought or felt, and quite often we forget the ones that never happened. If feelings came only from God, they'd be a reliable source for knowing what's true and what's false. But they don't. Feelings, impressions, and subjective experiences come from a number of sources; some originate in our own strong subconscious or conscious desires, others from spiritual forces of evil that seek to deceive and spiritually mislead us. The Bible provides some clear warnings about being deceived. Careful research into the life and teachings of Joseph Smith and the history of the Mormon Church tends to lead people out of the church rather than in and it tends to undermine rather than support the Mormon Church’s claim to be the one true church on the face of the earth. All the more reason to do one’s homework before joining rather than after.